This is a John Olsen limited edition fine art print titled Spoonbill and Egret 1983. The edition size is limited to 99 only, each image comes complete with a certificate of authenticity, it is printed on pure Archer’s water colour paper with the finest quality pigments, and the image size is 79.8x107cm with a RRP $2250, the work is Signed and titled by John Olsen. Spoonbill and Egret 1983 is a wonderful image based on John Olsen’s original painting from 1983. The fine art prints are much nicer in real life as the internet cuts back the true colour. John Olsen feels these mostly Australian fine art limited edition prints are a way for art lovers to be able acquire an affordable piece of his wonderful fine art works, you see as there is only one original painting or works on paper or water colour the public now has the opportunity to see and own a legal copyright image of that specific master piece signed and titled by John Olsen himself. John Olsen’s traditional fine art etchings prints silkscreen’s Lithographs have so far made it possible to let the public enjoy his work but never as affordable or as large as these fine art Australian works. 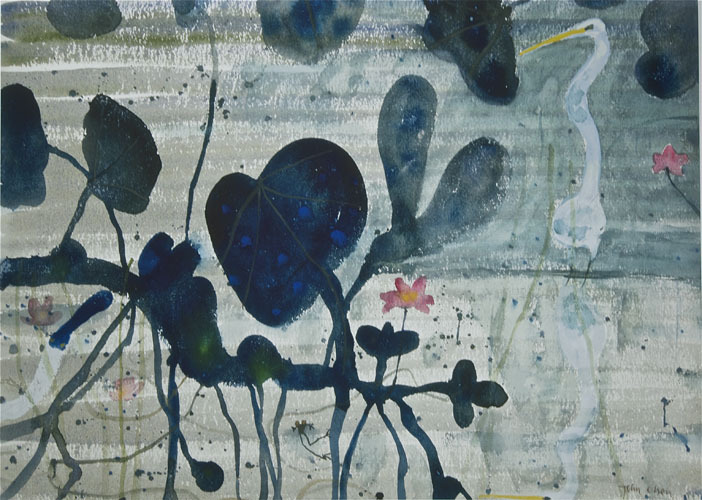 With the Australian fine art edition quality prints they can enjoy his fine paintings and works on paper even more so. The archival fine art productions range in size from A5 up to 1 .2m wide by 10m long. They are reproduced using pigment inks on 100% cotton fibre mould made 256 grams per square meter stock material which is pH neutral, acid and lignin free.